When you look at the Amazon, it is easy to see a violent place where every animal and plant must struggle to survive. With flesh-eating fish and carnivorous plants, deadly jungle predators and skilled Amazonian hunters, this is one forest you wouldn’t want to be lost in. The reality though is that despite the ferocious nature of the jungle, the Amazon represents one of the best examples of how nature can work in balance to create incredible diversity. Traditionally, humans fit well into this diversity. Indigenous Amazonian tribes were largely hunter-gathers, living in small family groups, and responsibly using the jungle for all their human needs. From medicinal plants to food to clothing and tools, whatever was needed, the jungle seemed to provide. In this traditional environment, communities could collect and hunt a vast variety of plants and animals, never putting stress on any one species and avoiding issues of overhunting or destructive harvesting. Even with larger population numbers, the jungle was able to provide, as long as people remembered all the vast diversity of food sources to be found within. Obviously, with the introduction of outsiders, the Amazon and the Amazonian way of life has been drastically changed for vast numbers of indigenous tribes. Today the Amazonian diet varies from almost a traditional hunter-gather diet to a purely Western imported city diet. Very few tribes or communities in the Amazon remain untouched and an almost universal difference can be found in the way farming has been introduced. On a small scale, slash and burn farming can be found in most villages and even in the more remote tribal communities. Believed to be first introduced by Missionaries, slash and burn farming allowed Amazonian tribes to settle more permanently around Missionary churches. In its most basic form, slash and burn allows for jungle gardens where people can grow starch-heavy staples like cassava, an original Amazonian foraged crop, as well as non-indigenous crops like corn, plantains, and even rice. These crops help fill out the more settled Amazonian diet and in general, small slash and burn farming methods still fit into the ecosystem of the Amazon without causing serious damage. Small changes, like more settled communities and slash and burn farming techniques, were only the start of the process though. As more and more outsiders ventured into the Amazon, life and diet in the jungle would drastically change. This true invasion had many fronts, from the gold and oil settlers, hoping to strike it rich to full industrialized farming companies. The Amazon today in many regions is vastly different than the one first encountered by Spanish and Portuguese explorers. The Amazon jungle might seem impenetrable but given the right motivation - money - it is much easier to conquer than you might think. Some of the earliest deep Amazonian expeditions set out in search of gold and oil. Mining in the Amazon is difficult and very destructive. First the forest has to be burned away and then the soil and river banks blasted to expose the underground deposits. Mining companies are known for some of the worst human rights violations in this region and seem to have no problem forcing indigenous peoples from their land if the payoff might be worth it. Besides land grabbing, mining operations also effect the river systems and in turn the food supply of many communities downriver. Mercury, cyanide, and other harmful mining chemicals, even in small amounts, can poison fish, kill off riverside plants, and end up in the drinking water of tribes along the river. In many regions of the Amazon, it is not the miners but the farmers who bring the destruction. While you might think of the Amazonian soil as some of the richest in the world, it is actually quite poor for farming. Thin soil levels and heavy rain mean that once the majority of tree cover is removed, the topsoil is easily washed away in just a few years leaving only rock and stone. Despite this truth, farming on an industrialized level has moved in. Huge slash and burn operations, nothing like the small garden plots used by most indigenous tribes, have cleared vast regions of the Amazon. 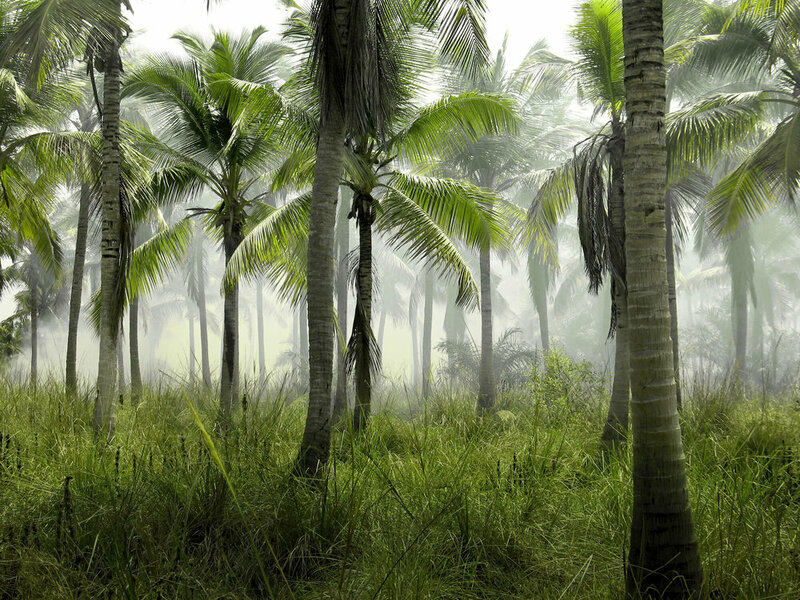 On millions of acres of once lush Amazonian jungle, corporate farms produce palm oil, soybeans, and other cash crops. These farms permanently damage the land with dangerous pesticides, which ultimately wash downriver to effect even more land. Even if there were efforts to restore jungle plants and trees to the damaged land, it would take a full century to even begin to recover. With less native jungle there is simply less diversity in the diets of indigenous peoples. On top of less land, many people in the Amazon have come to rely on these cash crops to fill out their now more restricted diets. Communities that were once completely self-reliant now find themselves forced to work for the corporate farming operations in order to feed their families. Worst yet, as the farming land deteriorates, cattle ranchers come in to strip it even further. Since Amazonian jungle is very difficult to restore, damaged farm land is simply transformed into fields for cattle grazing. It is estimated that up to 90% of all the land in the Amazon jungle destroyed by slash and burn techniques since 1970 is now used for cattle farming or to grow crops used to feed livestock. Rather than relying on small-scale bush meat hunting, the Amazonian diet now features high levels of beef, pork, and chicken, despite most of the livestock raised here being sold beyond the Amazon. Along with the corporations, whether farming or mining, plenty of people, hoping to find work, have migrated to the Amazon as well. With these new settlers came new trends and lifestyles. Today, in the larger cities of the Amazon, you will find grocery stores stocked with anything and everything you’d expect in a Western supermarket. Marketing campaigns as well sell “luxury” imported foods to people who once found all their needs met in the jungle around them. It’s no wonder that health continues to decline among the native Amazonian people. In addition to all the outside cash crop ingredients and livestock, many outsiders living and working in the Amazon have begun to overtax those indigenous ingredients that remain popular. Overhunting, once a nonissue for indigenous tribes, has now driven many species to the brink of extinction. Add to that less land for these animals and a taste for Amazonian “superfoods” abroad and it is not hard to see that the once mighty Amazon is being stripped more every day. The future of food production in the Amazon does not need to look so bleak though. In a region as full of diversity as the Amazon, surly we can find a balance. While the majority of industrialized farming operations remain destructive, many companies have begun to see food production in the Amazon as a balancing act. Foods like açaí and brazil nuts, popular abroad, are best harvested from native, wild Amazonian jungle with no need to slash and burn any trees. Food prices remain high for these more ethically harvested crops and at the same time, consumers are demanding their soy and palm oil come from rainforest free regions, driving down the incentive for farming corporations to expand into the Amazon further. Looking towards the native diet, the Amazon still has much to teach us. There are plenty of “superfoods” left to discover and we can remain dedicated to preserving these ingredients in ethical ways, both by working with local people and by seeking out native jungle harvesting techniques rather than industrialized slash and burn farming operations. With so much diversity, there will always be a market for Amazon ingredients and these communities will continue to seek out ways to grow and earn a living. Rather than leaving them to the will of the destructive corporate firms, we can make a conscious effort to support ethical companies working to balance food production and the health of the Amazon as a whole.